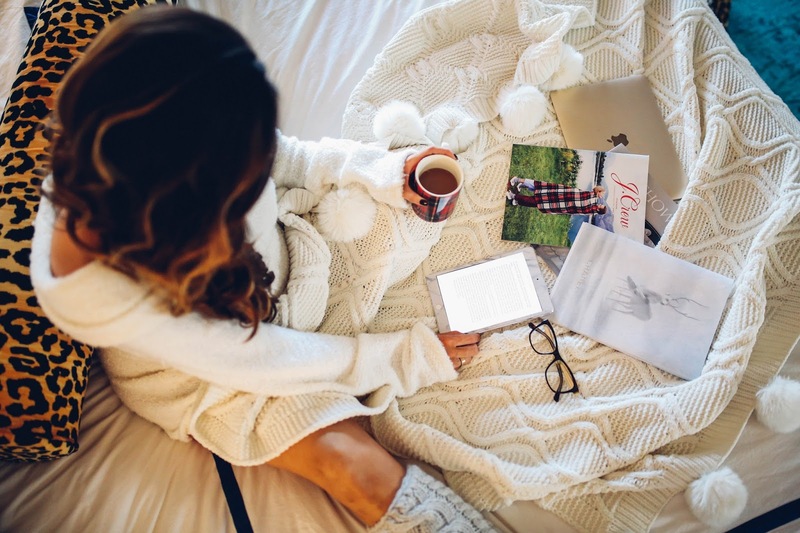 Sweater | Bedding | Headboard (mine is king and I purchased w/the full bed) | Nightstands | Leopard Bolster | Rug | Reading glasses are Gucci – Fall 2014? *edited! Blanket was a gift from Elle’s mom for Christmas! I found similar HERE & HERE & HERE. I actually was thinking I’d share my fall reading list in October but truth be told, I didn’t have enough books I loved. That could be because I was in my first trimester and sleeping instead of reading! I’m back on board now & just over Christmas my mom told my sister and I to download one book and we literally read that book overnight it was so good! It was by far the best book I’ve read in years and I’ll be sharing it in this list. It’s the main reason I am doing this post bc you guys will probably DL and finish it by tomo! This one was recommended last June by you all – when I did that last post. My mom also recommended it. I didn’t read it as quickly as I have some of the others on this list but I’d definitely recommend it. Stick with it for sure if you think it is slow moving! Okay, this one was a quick read for me… it has a few twists in it and will definitely keep your attention. This is a popular one – I feel like most people have already read it?! I’m not going to lie, I thought some of the other books on this list were better, but I do get the hype on this one! I really like Mary Kubica, but a few of her books I just couldn’t get into recently. (I was listening to hers on Audible at the gym this summer so that could be why!) But, this one, though it was tough to get into initially, has a pretty twisted and interesting story line. Oh my gosh, I downloaded this one randomly and had no idea I’d love it so much! It’s a page turner and I buzzed through it in a couple of nights. I think you all will like this one! This was a more recent read so it is fresh on my mind, and boy, it is really good. Very twisted (like all of these) but such a crazy story line! It will be one you’ll read quickly. I feel like this book is getting a lot of hype lately and I actually can see why! It is a bit longer and it may be a little dark for some of you so just a heads up. Personally, I liked it but I also love Law & Order SVU… (this may only make sense to other SVU lovers!) You won’t be able to put this book down once you get started! And the best for last – literally – the best! This is the one I mentioned earlier that my mom told my sis and I to read at Christmas! It is easily the best book on this list! It is fast paced, easy to get into, and you will love it!! That’s it for now – happy reading!! And please leave your recommendations in the comments! Thanks so much for this, I was in dire need of some new books to read! Behind Closed Doors is such a good one! It's one of those books that reminds me why I love reading. 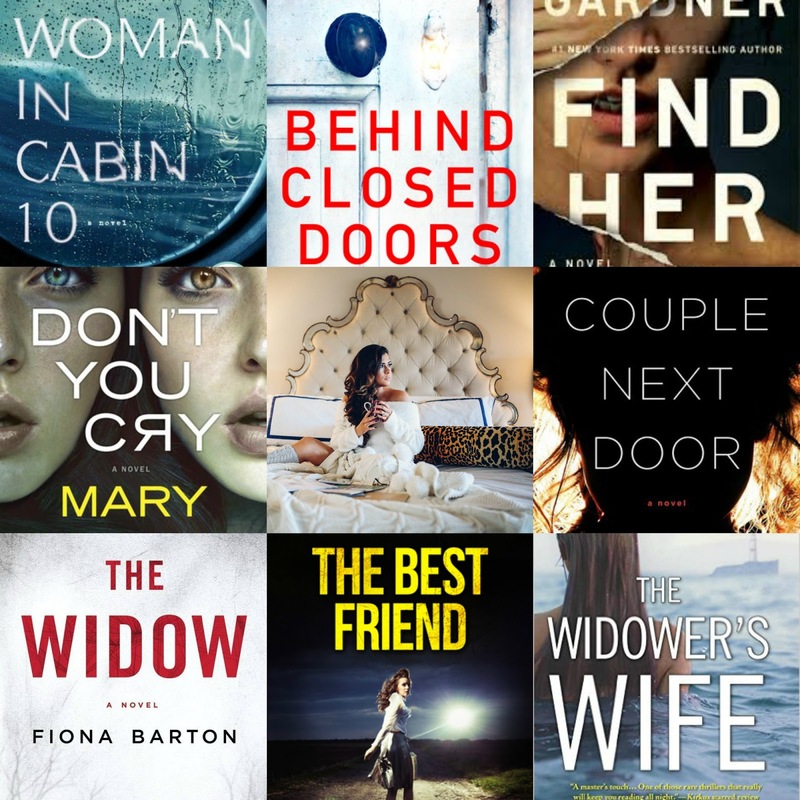 I'm always looking for new books and I LOVE mysteries, so this list is perfect for me! Thank you for the recommendations! Can't wait to pick up one of these! Love this list! Totally recommend "The Kind Worth Killing" – just as good as GOTT! You need to read The Butterfly Garden…. omg. I've been wanting to recommend it to people, but it's so twisted I've been hesitant! Thanks for this guide..I love reading when is so cold outside like in these days!!! I always love book recommendations! Cannot wait to finish my master thesis to have my life back and time to read just for fun. Read Maestra if you want something kind of twisted but also with art, fashion, and travel! It's not strictly a mystery but has some cool twists and will definitely keep you interested. That's the one. I recommended in my last post! I loved it! Also I fbagirked bc the author commented on that blog post where I moentioned his book! I just finished The Butterfly Garden. SO twisted but so good. I couldn't put it down. Pretty Girls by Karin Slaughter is great! It's a quick read because it is so intriguing! Very twisted book and would only recommend it to those who really like thrillers/mysteries! Those seem like amazing suggestions! "Before the Fall" is a really popular book. I just started reading it and so far so good!! Aw I can't wait to read some of these, you always have the best recommendations! On another note, your bedding and headboard are absolutely stunning! I loved that top 10 list you did last time, I bought a few of them right away. SO SOOOOO glad you did another one. Also, your sweater game is always on point. Get it girl. Love these kinds of posts! I'm always looking for books to add to my TBR list on goodreads! Thank you! Planning on downloading the last book on this list as soon as I finish my current read! I loved the 'Couple Next Door' – the ending totally surprised me! I read 'Behind Closed Doors' next and thought it ended so abruptly! It was definitely an interesting/fast paced read and had a couple twists I wasn't expecting. Thanks for the other recommendations! I definitely want to read more this year and I want to take all the recommendations I can! Thanks for this! Ok, I was deciding between Women in Cabin 10 and the Couple Next Door and I still can't decide which one to download and start reading. I'm kinda bummed that they are more hype 🙁 I'm going to check out Behind Closed Doors. I love the same kind of books you do. Have you read The Nightingale or The Husband's Secret? Those are great reads too! I love reading the same kinds of books as you and definitely love suspense! I saw some of these books on Amazon but couldn't decide which one to read. Thanks for the suggestions! Downloading Behind Closed Doors! Can't wait to read it!! I'm a huge fan of Law and Order:SVU and Criminal Minds so any mystery/thriller is my favorite! Who knew you liked reading twisted stuff!! I read some of the reviews for Behind Closed Doors. Im going to upset if the husband kills her dog. I want to read. But there are others. i love twisted to. Also Danielle Steele. Love you BTW. Yay! Some of my favorite posts are the book posts! I get so excited to get new book recommendations because I think it's so hard to try and research and find good ones unless someone else has read them. The Obsession by Nora Roberts was probably my favorite book I read in 2016! All the Missing Girls was a good one too! Thanks for all you do Emily!!! Definitely check out Dark Matter by Blake Crouch if you like this type of story; so good and definitely makes you think! A real page turner! I just finished Behind Closed Doors in two days!!! So good! I couldn't put it down! Ok. But seriously, got Behind Closed Doors this morning per your recommendation & got OBSESSED! Just finished the entire thing in one day! It was So GOOD! Thanks for posting your favs! Your bedroom is stunning! Love these book suggestions. Will definitely check out! Ooh, I can't wait to download Behind Closed Doors tonight. I've been looking for a good book to dive into. I love your book recommendations so please keep these coming! The Couple Next Door is definitely on my list!! Today I was having my quiet time and I read Romans 8:5-6 which verses, as always, really talk about and into my life. Paul talks about our sinful nature which rules above us and is full of selfish wishes that lead to death(not only eternal but also death of relationships etc. )Then, it talks about being under the authority of the Holy Spirit and concentrating mainly on developing our inner being to perfection because that is God´s main and only interest, as it is only our soul and not our body which is going to have iternal life. I have to be honest with you, watching and following blogs (including yours)became a huge problem for me, because looking at the perfect style, hair , make-up etc. makes me craving for those things and thinking about them all the time. It is like Eve in Paradise staying under the tree looking at the beautiful juicy fruit thinking about biting in it. Rome 8:6 says that those who let themselves led by the Holy Spirit gain Life and Peace. Since I have been following blogs (not only yours) haven´t been peaceful at all. I`am constantly craving, then buying, and after the thing arrived I am shorty satisfied and want the next thing. Please don´t misunderstand me, I am not blaming it all on you, because it is my own choice and own decision what I look at, or buy. However, today I am making the decision to concentrate on my inner developement instead of wasting my time and money on unneccessary things that lead to death and will parish. In heaven there will be no Chanel or Prada, but Jesus:)thank God! I am really curious about your opinion on the verses I mentioned and how you can adjust blogging and your christian life, because I think that we are sooo misled as chirstians by the world that shows us only its fashionable face but is sooo dead on the inside. I would be so happy to get an answer. I am praying for you and me staying on the right path all the time and being every day more like Jesus to gain this peace and life that are beyond our understanding. Please forgive me if I hurt you in any way, it was not my purpose!! Love your book recommendations! I just finished The Couple Next Door and I'm now reading The Shining Girls. Cant wait to pick up some of your recommendations at the library- I still love to hold a book! I have so many books I cannot wait to read in this new year! ♥ A.
I LOVE your posts about books and your feedbacks!!! Thank you so so much!! I already finished Behind Closed Doors (In 2 days) it is soooooooooo Good !!! Now onto Find Her. I can't wait for the next one! I want to read all of these. I love books like Gone Girl, it's totally my favorite genre of books. What a great list of interesting books! Can't wait to dive into some of these! I've read three of those eight and loved them! That just means you added a lot of new reads to my must read list this winter 🙂 Thanks for sharing your recommendations! Great post, i love your photos too! Thanks so much for sharing! I've resolved to read more in 2017 so I'm always looking for new recommendations. My recommendation isn't a mystery/thriller but I think everyone should read it. It's "When Breathe Becomes Air". It's a memoir about a neurosurgeons struggle and ultimate passing from cancer. It's sad of course but carries so many amazing life lessons and his writing his so gripping that I can't stop recommending it to everyone. Thanks again for sharing! Can you please tell me what size sweater you are wearing? Does it run true to size or large?? Do you remember the exact name of the headboard you have? I just love it. I looked on the link you provided and cannot seem to find it. I ABSOLUTELY LOVE the fact that you also love murder mystery books!! I love getting book suggestions and hearing other’s opinions on books but many are not into these books but my mom and I love them!! They are by far my favorite books ever! Mostly my favorite authors are James patterson, Agatha Christie etc, HOwever, I fell in LOVe with BIg Little Lies last year! It’s such a good mystery book!! I finished it in a week at the beach!! luckiest girl alive by jessica knoll. page turner for sure. so good!